A hopeless romantic looking for a great gift and card to send to your true love? Having trouble finding the perfect Valentine’s gift? Look no further…send a slice or two of yummy cake in a personalised card to the one you love. Whether you like a traditional 'I love you' card, or a tongue on cheek or slightly ‘fruity' card…we hope you will fall in love with our Cake Cards. Choose from a range of our fun, bright and unique Valentine’s Card designs, or send your love with a photo upload to celebrate good memories or fun events from the past. Write a personalised message inside your Cake Card and add a favourite emoji or two, choose from the fonts available and change the colour of your message too - red is a very popular choice for Valentine’s Day. Who wouldn’t like cake in the post delivered through their letterbox this Valentine’s Day. Decide on which tasty slice or two of handmade cake to send - with 12 slice flavours to choose from including 5 gluten free and 2 vegan cake flavours you will be spoilt for choice. You can make your Cake Card even more special with an added extras. Add a hot chocolate, coffee or for Valentine’s Day add some love tea to enjoy with the slice or two of yummy cake inside the card. We even have heart table confetti too. Send a Valentine’s card to a dog owner and their dog with one of our Pet Cards. Add a slice of handmade cake for a dog owner and a handmade dog treat for their dog or two treats for your dog - if the dog is your favourite!.. all in one personalised card. A great gift to send, card and cake in the post for Valentine's and not forgetting birthdays too! Our NEW Valentine’s Strawberry Blush is a great limited edition slice to our great range of flavours and a sweet treat for your sweet heart!. 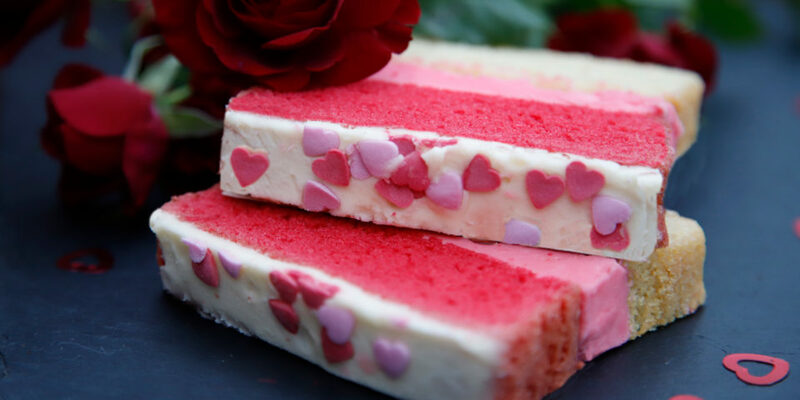 It’s a strawberry and vanilla sponge slice sandwiched together with an indulgent strawberry butter cream and decorated with sweet little love hearts. A perfect treat to send to the one you love this Valentine’s! Who will you send yours too? We are very proud of our 2 new vegan cake slices, Vegan Carrot & Vegan Chocolate to add to our Free From range. Our Vegan Carrot cake is perfectly spiced with cinnamon and nutmeg and loaded with wholesome ingredients, then topped with delicate lemon icing and sprinkled with walnuts for added crunch. It's moist and flavourful, undetectably vegan and most of all very tasty! Indulge in a slice of our totally decadent Vegan Chocolate cake, generously sandwiched together and topped with chocolate butter icing and sprinkled with nibbed cocoa pieces for added texture. It's rich, moist and delicious, perfect for all ages and occasions…yum! 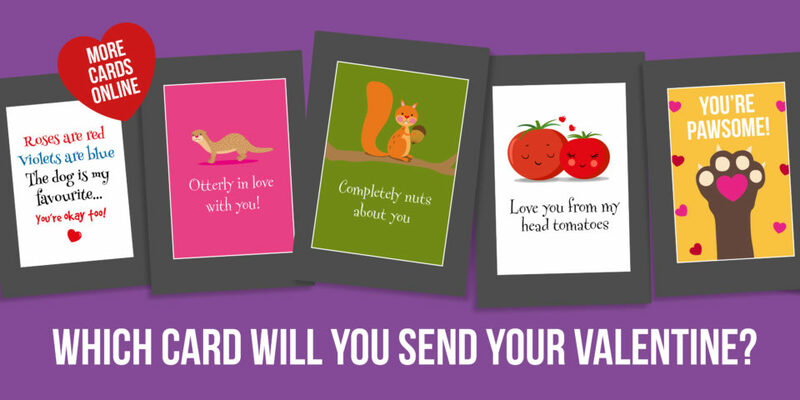 We have a selection of fun, and some naughty Valentine’s Day cards to send to your true love. We are regularly adding new designs so take a look at our love and Valentine’s categories. When you order your Valentine’s Cake Card you can select your delivery date which we imagine will be February 14th!. Order by 2pm for same working day dispatch (excluding bank holidays) For special occasions we recommend choosing the day before Valentine's to make sure your cake in the post arrives on time. We will add a sticker saying not to be opened until Valentine’s Day!. Send your Valentine’s card and cake in the post with a personalised message and we will have it delivered through the letterbox of someone special. A great Valentine’s card and gift in one to send to your sweetheart for less than £10! Ordering a Cake Card is a piece of cake!